Saturday night. Long weekend connected with yesterday´s wildly celebrated Midsummer state holiday, meaning everything is closed . Although in this part of the world everything is closed early and on weekends solid. Holiday or not. Hundred miles to the nearest, highly overpriced veterinary hospital. 200 miles to our trusted wonderful vet. This is a rather typical scenario. The Murphy´s law works amazingly accurately. When something happens, it is usually after opening hours or on weekends. And of course on holidays. Living the lifestyle we do, located literally in the middle of nowhere, we do our best to be prepared for cases of emergencies and keep our home "pharmacy" as complete as possible. Having worked as a veterinary assistant years ago, plus the experience with taking care of animals for over twenty years pays off tremendously and I try to constantly improve my knowledge and skills. Also, the chance to work and cooperate with some excellent veterinarians over the years makes things a bit easier. 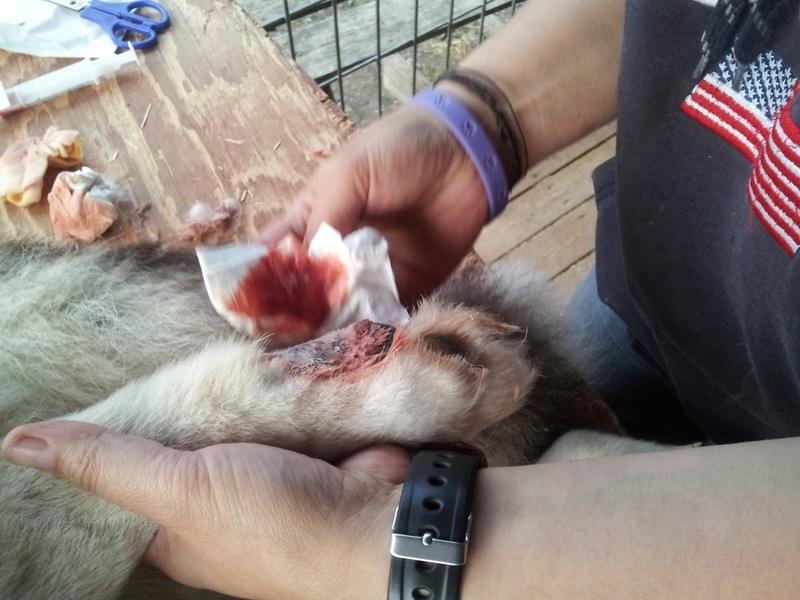 I often get questions from friends, visitors and also readers of my blog how do we manage here in the woods, and what if something happens, so I thought to share the most recent case with you and show you an example of what medical attention we sometimes have to apply as no other help is to be reached. 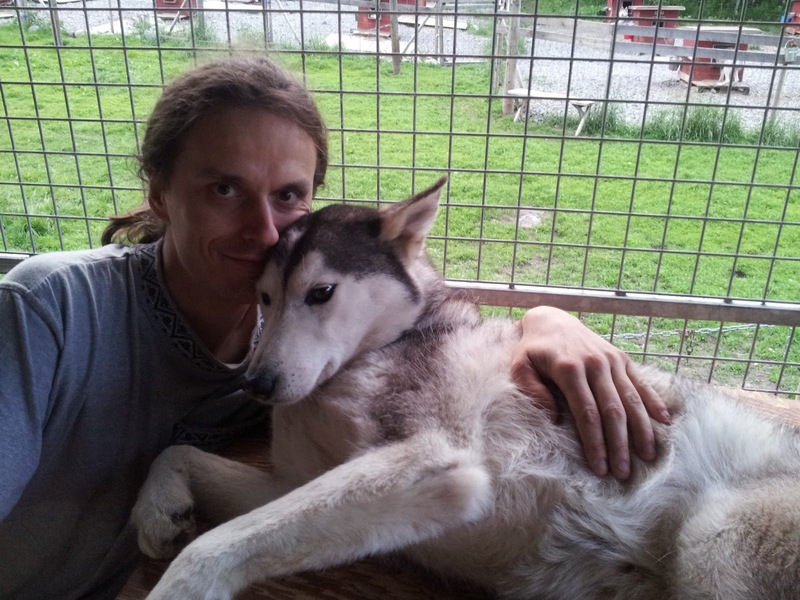 I luckily have a chance to consult most of the time with my vet over the phone or internet, but in cases like Maya´s, the timing of her injury in the middle of Sweden´s largest holidays didn´t give much other options. 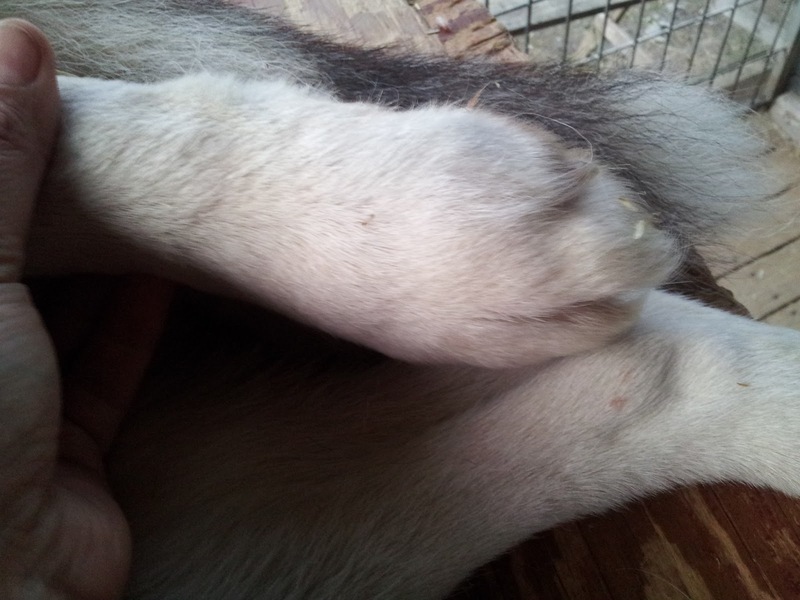 This is how her left hind paw looked like tonight. 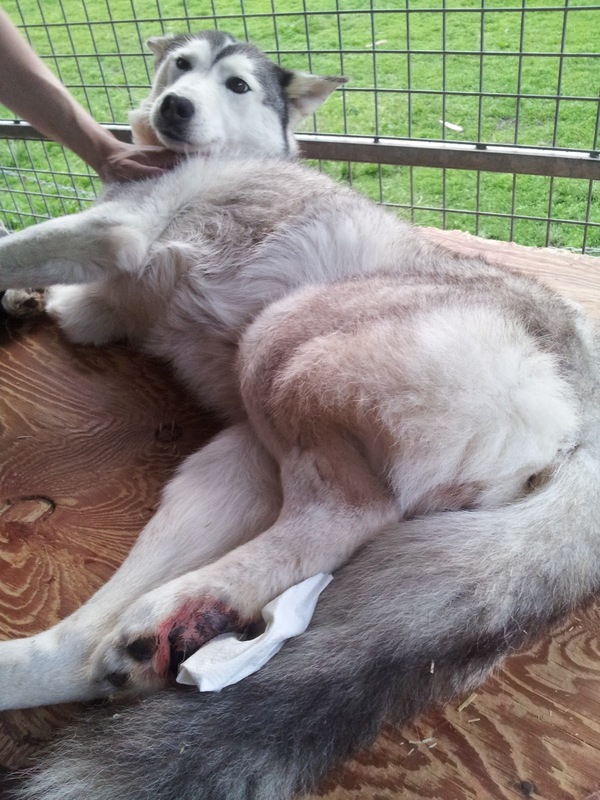 Yesterday morning I noticed her foot was swollen a bit and she had difficulties standing and running on it. I checked the paw for any signs of wounds - bite marks, stings, sharp objects that would penetrate into the foot. 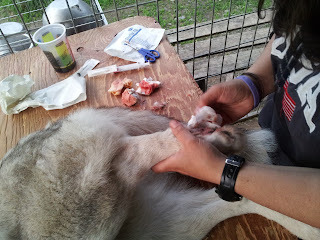 I also checked the paw, all the toes and the bones around for signs of anything being broken or sprained. But nothing was painful. I gave Maya REIKI and gently massaged the foot and we checked her again in a few hours. Everything looked the same. But Maya didn´t look her usual self. In the evening, at feeding time I noticed a wasp flying into Maya´s dog house and my suspicion of an insect bite grew stronger. With anticipation I asked Jachym to help me lift the roof to find what I expected - a wasp nest!!! The swelling seemed a bit bigger too and after some discussion we decided to opt for BETAPRED dose, which is an antihistamine we keep for cases of snake bites or stings by poisonous insects. Hoping this will bring Maya a relatively fast relief, we checked on her one more time during the night and went to bed. There was no improvement at all during the day today and we kept cooling her paw with ice cold wet towels. 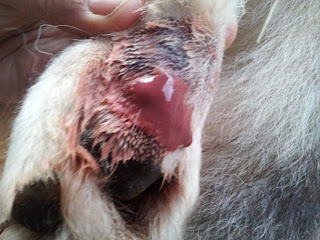 By today's feeding time, the entire paw was heavily swollen, and I could see the pressure causing much discomfort and pain. 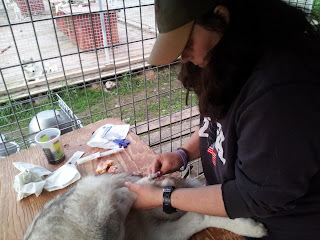 Equipped with scissors, compress, Betadine and a syringe and needle, I cut the hair on Maya´s paw, washed it with the disinfection and gently slipped the needle into the swollen area. 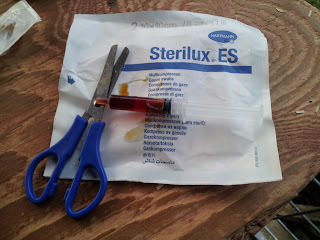 I pulled bloody puss into the syringe. 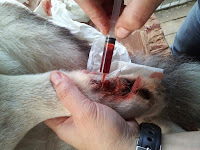 The moment the needle created a tiny "hole" into the effected area, infected fluid started to come out. It was, after all, an abscess!! After most of the infection left and the swelling subsided, I found the insect bite spot. It must have been a nasty, heavily infected wasp. This year we also noticed many hives around the garden and kennel, and Jachym got rid of four of them last night, that we found nearest to the kennel. I "puncured" two more areas to create more esacpe canals for the infection and started to push it out of the paw, once in a while cleaning the whole area with the Betadine. 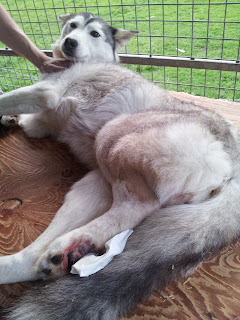 I pulled quite a huge amount of infection out of poor Maya´s paw. The poor girl was so patient and lay calmly, letting me do my job. She looked quite relieved too, after the pressure of the swelling has subsided. Snuggle for the brave patient. After pushing as much fluid as possible and properly cleaning the entire area with the Betadine, we consulted the proper dosage of wide spectrum antibiotic and gave Maya 250mg of Amoxicilin. As per instructions, she will be using these antibiotic tablets twice a day for a week. Living so remotely as we do carries with it certain necessities. We often cannot "wait" till the vet is open, because it may mean several days without medical attention. And that can be in some cases life threatening too. By no means we say that one can do everything at home and should not visit a veterinarian, but it is strongly responsible to be prepared. Discuss with your vet what medications and material you should have in your kennel´s pharmacy. Although you may not be living so remotely as us, there can still be situations when reaching your vet and immediate medical attention might be impossible and you´ll have to take over. I am working on a few more posts related to medical attention and health care, so stay tuned! Let me know if there is any specific topic you´d like to read about and feel free to send questions in comments bellow.